Okay, so the weather is improving right? Well, at least in a lot of areas it is. It will be time for some outdoor attention at your house. Your backyard and even your front yard will be begging for some kindness, and there are a few things you can do to make it look fantastic. Here are three things you can do to add appeal to your outdoor space. Clean up the clutter and dirt. I can’t stress this enough. Clutter and stuff laying around makes a space look messy. Whether the clutter is toys, yard tools, or just a pile of pool towels, picking it up and putting it away will make a huge impact. That’s where I always start. I address the easy stuff first. Now you’ll be able to address the horizontal surfaces of the backyard, the patio, a table top, etc. Get a wet rag and wipe off. Step one finished. Trim your bushes and trees. I have a palm tree and a lemon tree in the back corners of my backyard. At times, the palm tree will have one or two hanging down and they will be starting to dry and turn brown. These low hanging nuisances are easily trimmed with a pole saw and it changes the look drastically. This palm stands like royalty behind my swimming pool waterfall, so when it looks trimmed and tidy, it makes a huge difference. The lemon tree blooms constantly here in Arizona, so we have to cut off branches that almost touch the ground under the weight of the fruit. We pick the lemons and then trim some of these low hanging branches, transforming the underside of the tree. Step two finished. Pick your weeds. 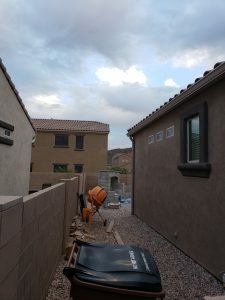 Here in Arizona and in many areas in the southwest, we have rocks in our backyards. I guess you can say we don’t really have yards as most would define them…grass. When the rainy season arrives, I swear my neighbor throws handfuls of weed seeds over the wall, while snickering like the Grinch. Then he waits until the weeds grow and laughs as I address the problem. By picking weeds, I get back to the clean and organized look of a rocked backyard space. It’s amazing how much better it looks. Step three finished. By doing these three simple things, I get my backyard to a clean, organized, and welcoming oasis, worthy of a party. The beauty is that it doesn’t cost me anything other than a bit of sweat equity to transform my backyard. Perform this three-step ritual a few times a year and your backyard will continue to impress all who venture there. We hope you will use these quick and easy steps to work on your outdoor backyard presence. Send us before and after pictures of your outdoor space, cluttered and then clean. We would love to share in a separate blog post how our readers are making their backyards an extension of their home lives. Send pics and your story to dan@backyardflare.com and thanks for reading and we hope to hear from you. Our DIY Fireplace Customers Rock! Backyard Flare DIY fireplace customers are everywhere. We don’t just cater to the Tucson, Arizona area for our customer base. Our amazing customers are in warm, cool, and even frigid areas. In fact, they are all over the country and even abroad. But, the cold weather is here and the country in a lot of places is already under a blanket of white. Oh my gosh, and it’s only just November, so there are a few months of cold left. Because of the weather, a good portion of the U.S. is unable to build in their backyards. There is no possibility of digging into the frozen rock-hard ground for the concrete slab foundation. There is no way to add water to mortar to lay blocks because it would be so unbearable to work with icy hands in that environment. You get the point. Some of you will have to wait, sorry. It is great that we have a customer right down the street from Backyard Flare headquarters. Rob in Tucson found Backyard Flare online and contacted us for help building his outdoor DIY fireplace. When Rob realized we were right down the street, he asked for design help. I spoke with Rob and he introduced me to his backyard. He wanted a corner fireplace with gas and together we brainstormed some cool outdoor fireplace layouts. Rob decided to use the Douglas Mini design and morph it a bit to match his and his wife’s vision. Rob’s DIY fireplace is visible from the driveway. Rob started with his DIY fireplace and he had a lot of questions. All in all, he has done a fantastic job and I have visited his work site a few times to check in with him. As a husband, father of two small tykes, and a professional from Monday through Friday, Rob doesn’t have a lot of time during the week to work. He has spent the weekends building and has rocked the progress. It has taken him a couple months, but he can see that completion is close. Dusk has arrived and the fireplace is lit. I went to see Rob’s DIY fireplace the other day again and it looks great. Rob is ready for firebrick, horizontal material, and his veneer. At that point he will be done. We hope you love it as much as we do with the gas setup, arched firebox, and the LED lighting he added. He told us he has never built with mortar and was skeptical as to his abilities, but he was happy he did it. He learned a lot and he realized that he was a lot more capable than he thought, especially with his construction plan from Backyard Flare. The DIY fireplace is burning bright. The LED lighting is on adding that special look. We will continue to bring you photos of his progress and we will definitely feature Rob and his finished fireplace in an upcoming blog post. 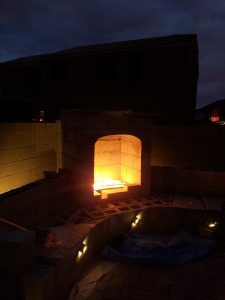 If you think you are ready to step into a DIY outdoor fireplace build, like Rob, and are ready to transform your backyard, visit Backyard Flare and we can help. We know that you can do it, and, just like Rob, you just need a DIY construction plan to follow. If you have any questions about anything, please let me know. 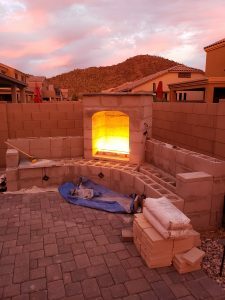 I am always excited to hear from a fellow DIYer, or someone wanting to learn more about how to beautify their backyard space with a DIY fireplace. I can be reached at dan@backyardflare.com and as I always say, “Happy Building”.